Cat Attract™…the problem cat and kitten training litter. This new scoopable litter provides a solution for cat owners whose cats do not use their litter box. 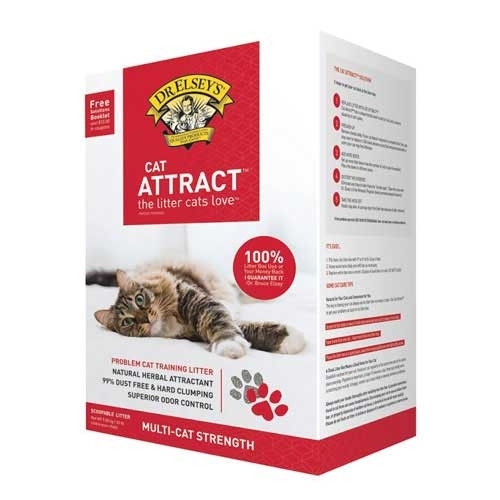 It is blended with a natural herb attractant, Cat Attract’s herbal scent, ideal texture and particle size combine to solve litter box problems. Non-use of the litter box is the number one reason a cat is abused or finds itself in a shelter. Cat Attract™ is the first cat litter to specifically address problem cats. It is also an excellent litter for getting kittens off to a good start with their litter box habits.